Bobbie's children never listen to a word she says. Even worse, her mother has a new boyfriend: the notorious child expert Dr Know, who dishes out hard-line advice to the nation. Could parenting classes control her kids - and save her marriage? Andy's wife is due to run a Perfect Parents course at the local school. But when she scarpers, he's left to look after their two teenage daughters - and face his own childhood demons. Vanessa has found love, second-time round. But one night, six-year-old Sunshine is deposited on her doorstep with a message from Vanessa's estranged daughter, 'Please look after her'. This time she's determined to get it right. 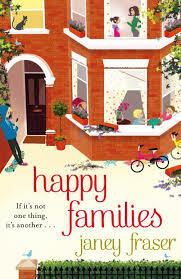 Can Bobbie, Andy and Vanessa really learn the secret of raising a happy family? I have never read a book by Janey Fraser, I was a little worried about starting this one as I haven’t read the authors previous books but when I contacted the author she assured me that although characters from the previous books do pop up in this book it Is in fact a stand-alone book so with my mind at ease I couldn’t wait to get started. The book is told from three characters points of views Bobbie, Andy and Vanessa. Bobbie has two children Jack and Daisy who to put it mildly are quite a hand full! Bobbie is struggling to keep the children under control and when her sister in law Pamela informs her she will be doing a perfect Parent class and that she should come along for some tips! Andy reaches a point in his life where he wants to spend time with his family but when he makes the ultimate decision his wife then declares that she has to go away and so he is left not only looking after his daughters and the house but he finds himself having to take his wife’s Perfect Parent class that she was due to start. Vanessa is making the most of her life the second time around she has a successful business that she is passionate about, she has found new love with Brian but the last thing she was expecting was her granddaughter who she has never met, to be dropped off and left in her care. It’s not long before she joins the Perfect Parent group to try and get some help. The three characters are all linked Andy is Bobbie’s husband’s brother in-law, and Vanessa soon becomes a friend of Bobbies when they meet at the Perfect Parent club. I am not a maternal person and I usually find books that have little people characters in usually get quite a knock from me because of the annoying baby talk, I was waiting for this to be the case with this book but in actual fact the kids had me in hysterics! From the first chapter when Jack decides he wants an Easter Egg and then decides to hide out of reach of his mum just popping a leg out here and there to tempt his mum to drag him out! I was won over right from this moment as I could see this scene being played out in my head and this really made me laugh out loud. As the book moves on there are many times when the children bring some humour to this book that also has you cringing at the same time to. I would be hard pushed to pick a favourite character from this bunch as they were all such fabulous characters but Jack will be a character who I will remember for a long time yet, he is so mischievous and I couldn’t help but laugh at his behaviour (yes I know I wont be laughing if I have a child who behaves like this!) I also loved the friendship between Bobbie and Vanessa this friendship felt very real. With it being a new relationship the ladies are still building trust in their friendship and getting to know each other and the author does put the friendship through some situations that do test their friendships and the reactions to these events are very realistic.